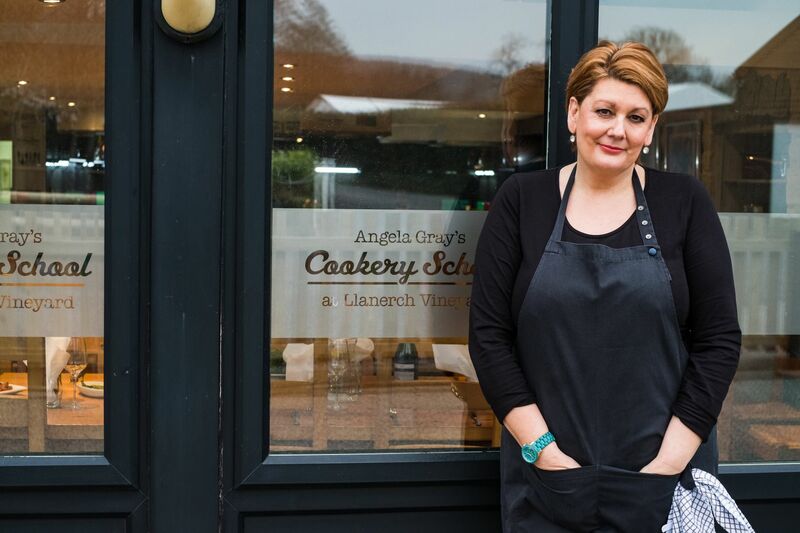 Angela opened the doors to her Cookery School at Llanerch Vineyard in April 2010. 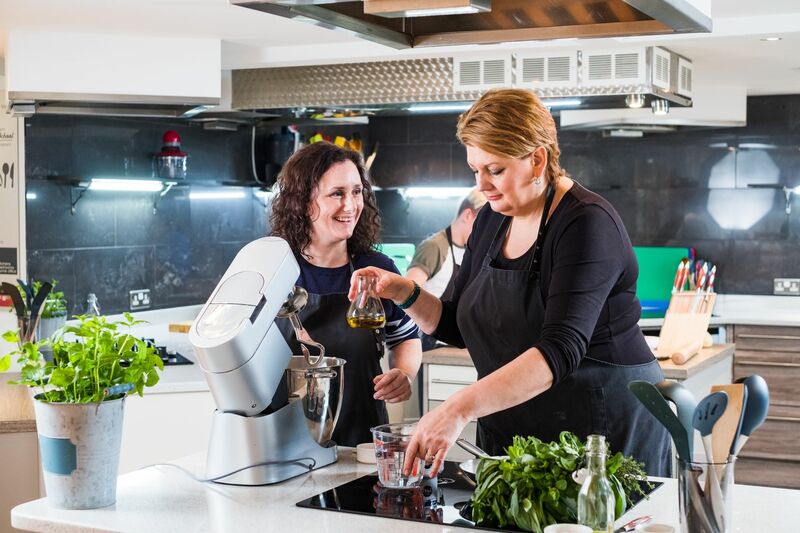 She is now in her seventh successful year and has already been voted into the Top 10 UK Cookery Schools by The Independent and The Telegraph. Her Cookery School has also been shortlisted for the Best Cookery School in this year’s Great British Food Awards and chosen to join an elite selection of 50 top schools in The National Cookery School Guide. Angela has created a wide variety of cookery classes and events, where she loves to share her knowledge, skills and anecdotes. Angela has worked prolifically in the food world starting her career as a personal chef working in Europe and North America. Her clients have included an esteemed list from European aristocracy to high profile clients such as Lord Lloyd Webber. Angela then moved into the restaurant business where she developed her relaxed style of cuisine with a strong Mediterranean influence. She returned home to Wales where her culinary path changed direction and led her back to school. After 3 years at University, she graduated with a BSc Honours degree in food science. Whilst studying Angela also ran a small fine dining catering business, and held a twice-monthly Cooking Club in her home. The Club lasted for 15 years and was to form the basis of the television cookery series that was to come her way. Angela was talent spotted after producer Mark John (Vision Thing), read some of her articles in a magazine. Next came two prime time cookery series for BBC Wales “Hot Stuff” and “More Hot Stuff” with Angela as the presenter and chef. She has also had several radio series to her credit including “My life on a Plate” and “Packed Lunch”. Angela remains a consistent contributor in the media world, making regular appearances on “The One Show” with Jay Rayner judging finalists in a bid to find the nation’s favourite dishes. Together with her team, she has entertained people from all over the world and has created a popular venue and experience for corporate team building and private events. She is a mentor to young budding culinary talent and is most at home when sharing her passion for great cooking. In her own words “it’s a dream job! 2016 marked the beginning of a 5 book project with publishers Graffeg, a series of five seasonally themed cookery books. Angela has drawn her inspiration from the seasons, her career in food and her childhood food memories to help craft the pages. The Winter, Summer Collection and Festive Recipe Books have been released and the Spring and Autumn Collections will follow in 2018. Each recipe has been vibrantly captured by food specialist and photographer Huw Jones, enough to inspire anyone’s culinary creativity, and the books offer something for all palettes and preferences. Find the perfect dish to enjoy and share with family or friends through the seasons with Angela Gray!